This week's Diva Challenge is to use circles as a string. You could do them anyway you wanted to. I chose to do mine free hand and have them intersecting. For a brief moment I thought about doing something similar to Michele Beauchamp's post earlier this week. 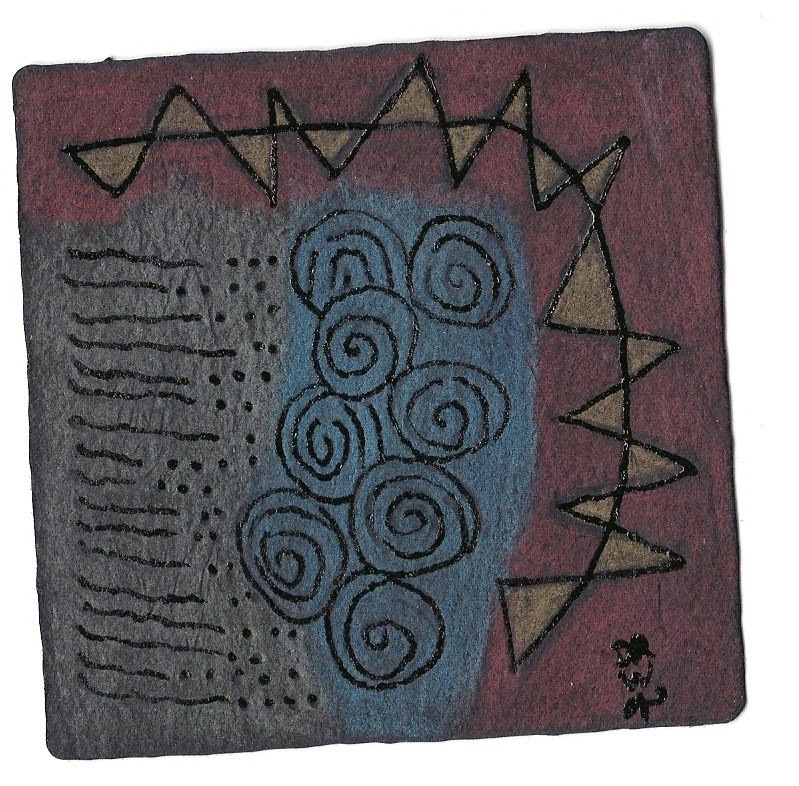 She used the basic tripoli pattern to make circles and then filled them with various patterns and then also connected them. I did not think about it very long and decided against it when I saw her feed on my reader. For this week's challenge she chose to continue with this theme. I did not want to try to match her. After I did the string I just began filling the different sections with tangles. Here is what I came up with. I hope you enjoy it. Tangles used: Bales, Tipple, Fassett, Paradox, & Shattuck. There are a couple of patterns that do not have names as far as I know. They came about when I was experimenting with some basic elements of Zentangle®. Some of them are a part of the "S" pattern post from before. The other originated from a pattern that I saw on a plate. I may get around to naming them someday. I hope I have some time to look at the other submissions on I am the Diva. I have a busy week. I have a class this weekend and have a show/display next Friday. Would encourage you to go look and also participate in the challenge. You can click here to go to her blog. Heard a lot about the embossing method taught at Tangle U. Have seen a few examples of it and have wanted to try it. I used a stylus from my PDA to make the tangles. Not sure if this was too soft or it is that I do not have wax colored pencils. One thing I read said that should be soft colored pencils. Mine are a generic form and I think they are hard. When I tried to layer the color, it began to fill in the tangles. To not totally lose the tile I borrowed a technique from another thing taught at Tangle U which was to use a black Glaze pen to make the tangles. I used this to redo the tangles after I had layered the color. Did not turn out too bad but is not the embossed look that I had hoped for. Not going to go out and buy a set of new pencils as I think the wax pencils tend to be a little pricey. Here is what I ended up with. I hope you like it. Had to scan this as the light reflected off the glaze ink and could not see the black. Did not get a chance to comment on many of the things posted last week. Had a great time at the Hideaway. Hoping to incorporate some the things we did into classes in the near future. But I digress, since this is about this week's Diva Challenge. The Diva chose a tangle which I have used before but not very often and the task was to use variations or tangleations. I do not know that I have ever used it as a primary tangle before. I was not really sure what I wanted to do. I think it is a good frame or tangle to set a boundary. I chose to use a spiral as my string. mostly because it has been a while since I did this and I do like using a spiral and then transitioning different tangles. Here is what I came up with. I hope you enjoy it. Used a variety of pens. I used both the white Insignio and the Gelly Roll as well as a Zenstone and Prisma white wax pencil for the highlighting. And just a little bit of graphite. Now I am off to look at the other submissions on I am the Diva. If you have not all ready done so, would encourage you to explore the many great pieces of art created by very talented people. Returned home yesterday from 3 days of fun, relaxation and tangling with about 20 other CZTs. I have not spent so much time tangling in such a short period of time since attending my training almost 2 yrs ago. Had a great time interacting with some new folks, some that I only had had contact with over the internet, and also some family as my sister and a cousin, both CZTs also attended. Learned and was able to try a few new things that will try to incorporate into some classes. Others I will just use as part of my practice. Not sure when, as I am now back in my usual routine and full time job, but will try to post some of the things that I am doing as a result of things I learned. Don't have any pictures that I can post now. This week's Diva Challenge is a Duo Tangle challenge. You are suppose to use only these two tangles to create your tile. I have used both of these tangles before, but am not sure that I have ever used them together. I did want to try some new things on this. After the tangle Well was released, I saw some very cool variations on Helen William's blog a little lime. She does such a great job at taking tangles and setting them free by doing a free-hand version. she did this with Well. She has step outs and a video posted on her blog. To see them, you can click here. I also like the way Shelley Beauch makes tangles trickle off. I tried something from both of them. Well was difficult to trickle off from the grid. I was not ready to tackle Helen's free form Well and used her circle grid method. Not sure if it would have worked better to have this trickle off. Oh well, it is about the process not the end product. Here is what I came up with. I hope that you enjoy it. I kept this simple and used the traditional process. I used a micron, and a pencil. I did not use a string. I hope I will have some time to look at the other things posted, and to make comments. May be a little tight as I will be attending the CZT Hideaway the next couple of days. Looking forward to having a good time working on things and also hopefully learning a few new things I can use in some classes. I would encourage everyone to go to I am the Diva and look at the great pieces that some very talented people have created.